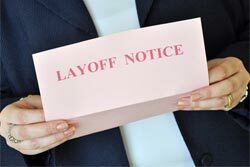 Have you ever thought about what you would do in the event of a layoff? It used to be a term associated with large factories and nationwide companies. However, the economic downturn of the last few years has placed a much wider array of businesses at risk. Most are still experiencing difficulties, and very few people feel entirely secure in their jobs. Some layoffs are completely expected, while others come as a shock. No matter what your situation, it is always good to ere on the side of caution. If you think that a layoff is in your future, it is important to begin the preparation process as soon as possible. Even if you end up keeping your job, you never know when things will turn sour. 1. Review your emergency fund. How much money do you have in your emergency fund? Do you even have one? Conservatively, it would be nice to have six months worth of expenses in your emergency fund. For example, if your monthly expenses are $3k you need $18k in liquid savings to meet this goal. If you already have an emergency fund, you should spend your time adding as much money as possible. Six months may be adequate, but 12 months is better. On the other hand, if you don’t have an emergency fund you must start one as soon as possible. Yes, this can be difficult if money is tight. But, if you know you are going to be laid off in the future, it is something that must happen. Even if you don’t get to the full six months before losing your job, anything is better than nothing. Your emergency fund needs to be “liquid.” In other words, you should have easy access to the money. An online savings account or any personal/savings account with a local bank will do. 2. Consider your health insurance options. Believe it or not, some people do away with health insurance altogether when they are laid off. They do this for one reason: they feel that they don’t have the money to continue paying for a policy. While you may have to make some changes to your expenses and spending habits, getting rid of health insurance coverage is not an option. If you are uninsured and end up sick or injured, you will spend more on medical bills than you would have on a monthly premium. COBRA. usually the most expensive of the three as you are going to be purchasing the same insurance that you currently have through your employer. Individual Policy. Depending on your age and medical history, buying an individual policy can be affordable. Policy Through Your Spouse’s Employer. If available, your best option may be to have your spouse add you to their policy. It is often times the most cost effective choice. It is extremely important to research weigh your health insurance options carefully. You don’t want to go without insurance, but you also want to get the best rate you can. 3. Get your resume in order. Just because you are going to be out of work does not mean you want to remain that way for an extended period of time. If you are going to find a job in a hurry you need a complete, error free resume. Many years may have gone by since you last updated your resume. You cannot let this intimidate you. Using an old resume is not going to get you anywhere. Instead, you must include your last position along with a description of your job. It may be well worth the money to hire a professional resume writing service. Yes, money is tight and you don’t want to overspend on unnecessary items. But this is a job hunting expense that can really improve your chance of landing on your feet soon enough. Do you know anybody who can help you find a new job? Whether it is a family member or a past supervisor or coworker, reach out to everybody in your network. At the very least, let it be known that you are on the prowl and willing to consider all offers. Remember this: if nobody in your network knows you are out of work, nobody will think of you for a new position. There are many ways to network for a new job including using websites such as LinkedIn, calling and emailing friends and family, and attending job fairs and local networking events such as those sponsored by a chamber of commerce. 5. Make a list of five things you will do every day to better your chance of landing a job. You cannot sit around and hope for the best. You have to be proactive if you are going to find another position. When you have a concrete plan in mind before you get laid off, it is much easier to hit the ground running on day one of your unemployment. Search three online job sites. Make contact with at least one person in your network. Send your resume to at least one company, even if they are not actively hiring. Scour the classified ads in the biggest newspaper in your city. With the recent economic crisis, it seems like no job is 100% safe. Whether you sense a layoff coming, or are hit with the news out of the blue, you need to be prepared. If business seems unstable, focus your efforts on pumping up your emergency fund, learning your insurance options, and laying the ground work for finding a new position. No matter what, a layoff will be a blow to your life, but at least you’ll know you’ve done your best to soften it. I’ve been laid off for 6 months and it was completely unexpected. I had no emergency fund, but thankfully had a severance package. I also was still covered under my parents HMO insurance. I’ve been working my network and still haven’t found anything full time. I’ve been trying to save 6 months worth of earnings for an emergency fund but it’s pretty hard to do. I think it’s one of those things that you don’t care about until you need it. Thanks for the reminder… I’m going to get back on track! The one thing that I would add is to activate your side income source. Yes, you need to make job hunting the same as a job, but you should also have a secondary income source…even if it just pays for groceries. I have to agree with Sandy. Prepare for the worst and always be trying to diversify your income streams. It is very risky to bet everything on one job and one pay check. I really need to start working on my emergency fund. I just started a blog to help me get there. Great points! One strategy I saw work well was many friends of mine who were part of a mass layoff at work went to the company’s 2 main competitors the next day. Several of them were hired that week! It was great to see them get jobs so quickly. Interesting post Emma. It’s definatley an eye opener. Very good advice! I’d say that anyone who thinks their job is not totally secure should be proactive about this & get as much ready as possible. Have a plan B, and C, and D! My husband was laid off from work and it took him 6 months to get another job. I completely agree with all of the points that you have mentioned here. It was an extremely de-motivating time for us because it was his first job after college, and he got laid off even before he could finish his learning curve. With no help from our limited networks, getting an interview was difficult, and acing it was even worse due to the lack of self-confidence. Now that both of us are employed, these posts remind me of that time and how difficult that period was. COBRA is pretty expensive … when I left my job, I bought my own through an individual plan, even though I had the option to use COBRA.